Commander, this one'll cost you $19.99. XCOM: Enemy Unknown, the turn-based strategy title that took 2012 by storm, will be coming to iTunes this Thursday for iPhones, iPads and iPod Touch. This is a complete port of the original, except for a few maps, and will set you back $19.99 when it debuts. Firaxis' Jake Solomon has said that this mobile title will be a faithful port of the original AAA title. "We still have all the destructible environments, there's the fog of war," said Solomon. "It really is XCOM." Multiplayer won't be there at launch, but will be released later as a free update. 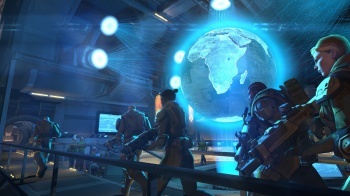 XCOM: Enemy Unknown is Firaxis' reboot of the venerable alien invasion series, and gained all kinds of plaudits when it first launched on consoles and PC; this will be its first mobile launch. Good luck, Commander! Try not to get everyone gassed by Thin Men; it doesn't do morale any good.